The era of drawing seems to have come to an end. Most artists focus on painting, sculpting, or making large experimental installations. The humble sketch drawn using a good old fashion pencil is a thing of the past, at least in the professional world; it has been relegated to children's playtime. In an effort to redeem this old fashioned medium that was once so prolific, the Institute of Contemporary Art is holding an exhibition focussing on 'Works on Paper'. At the same time, Keep Your Timber Limber is an exhibit that addresses the issues of gender, sexuality, feminism, fashion, war, censorship. 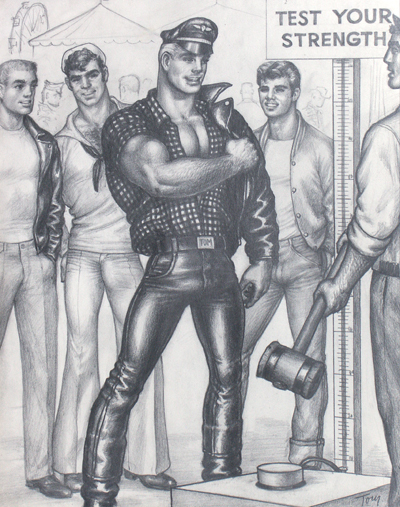 Starting from the 1940s onwards, artists featured include Judith Bernstein, Tom of Finland, George Grosz, Margaret Harrison, Mike Kuchar, Cary Kwok, Antonio Lopez, and Marlene McCarty. A lot of the drawings were commissioned for commercial reasons, having been printed in comics and newspapers. There are an number of events coinciding with the exhibit as well. Starting off the series is Bend over I'll Drive. The talk by Marlene McCarty discusses feminism and queer theory, and can be booked for £10. This will be followed by a discussion on Feminism, War and the Body, which costs £5, and will be on the 6th September. You will also be able to attend Honk! If Your Body's Not Yours!, which will feature archived audio material, and a fashion screening of From Style to Substance.